Introducing Religion 4 Edition Places religious studies squarely within the twenty-first century Introducing Religion, 4/e explores the different ways of looking at religion in the twenty-first century. 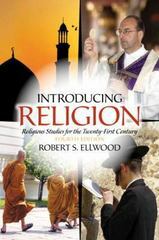 A broad overview to religious studies as a discipline introduces students to the various subjects of religion. Introducing Religion teaches readers how to think in academic religious studies and its main areas, including: sociology of religion, psychology of religion, history of religion, religion and art, ethics, and more. The fourth edition has been expanded with new chapters exploring topics of contemporary interest: myth, spiritual paths, religion and popular culture, religion in the computer age, religion and war. Contemporary topics engage today’s students, relating the topics to the changing world around them. MySearchLab is a part of the Elllwood program. Research and writing tools, including access to academic journals, help students explore religious studies across more subjects. To provide students with flexibility, students can download the eText to a tablet using the free Pearson eText app. NOTE: MySearchLab does not come automatically packaged with this text. To purchase the text with MySearchLab, order the package ISBN: 0205996841 / 9780205996841 Introducing Religion: Religious Studies for the Twenty-First Century Plus MySearchLab with Pearson eText -- Access Card Package Package consists of: 0205239927 / 9780205239924 MySearchLab with Pearson eText -- Valuepack Access Card 0205987591 / 9780205987597 Introducing Religion: Religious Studies for the Twenty-First Century ALERT: Before you purchase, check with your instructor or review your course syllabus to ensure that you select the correct ISBN. Several versions of Pearson's MyLab & Mastering products exist for each title, including customized versions for individual schools, and registrations are not transferable. In addition, you may need a CourseID, provided by your instructor, to register for and use Pearson's MyLab & Mastering products. Packages Access codes for Pearson's MyLab & Mastering products may not be included when purchasing or renting from companies other than Pearson; check with the seller before completing your purchase. Used or rental books If you rent or purchase a used book with an access code, the access code may have been redeemed previously and you may have to purchase a new access code. Access codes Access codes that are purchased from sellers other than Pearson carry a higher risk of being either the wrong ISBN or a previously redeemed code. Check with the seller prior to purchase.